This Contemporary-styled large wicker basket is both a stylish way to display wrapped presents or pine cones and other filler decor or serve as an extra-large storage basket to hold your holiday pillows and throws. 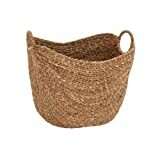 Handwoven from natural beige colored smooth flatsedge wicker, this decorative basket has a unique oval shape with tall sides, a curved silhouette, and chic circular handles. The thick wicker rope is braided into horizontal and vertical bands to form the firm, non-collapsible body, making this large basket a very strong and durable stylish home storage. Wrap the round handles with brown, gold, and orange ribbon for a Thanksgiving look or red, green, and silver ribbon and holly for a Christmas feel! For a unique gift idea: Fill with colorful tissue paper and display a few bottles of wine and homemade treats to bring to your next holiday party or as a fun gift for a loved one.